If God did indeed create the world and all of its many cute kittens in 7 days, then on the 7th day his Holiness surely would have had brunch. Like any reasonable person would. Let’s get one thing straight: Sunday was not made for getting up in the morning (not at all really), getting stale bread into the oven and then eating it with whatever suspicious looking leftovers you might find in the unexplored crevices of your fridge. 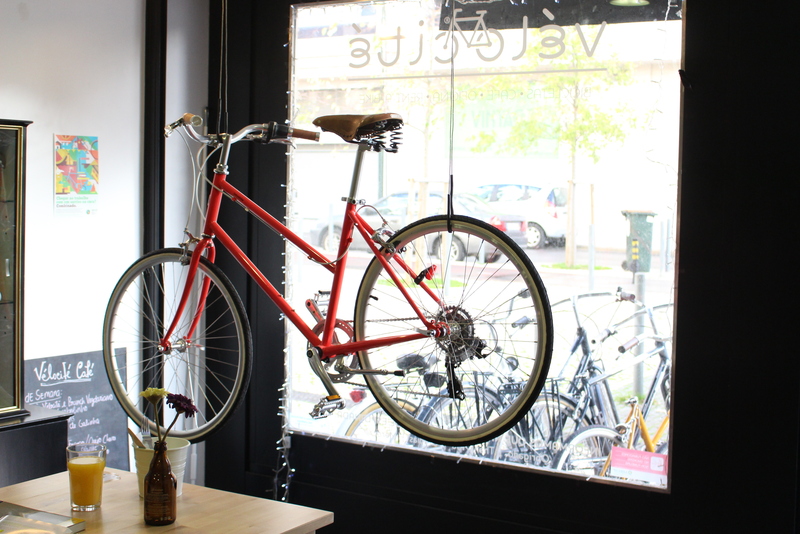 A more civilized alternative would be to brunch in “Vélocité”, which is also a bike shop and has been filling the extremely hilled city of Lisbon’s desperate cries for more bicycle shops for over three years now, long before the hipster beard was even invented. Much as we love Lisbon, brunch here is not really a thing yet. It’s growing, thanks to gentrification, influence from tourists and the branding of Lisbon as the new Berlin (which means not all that much, really) but it’s still got a ways to go. One should also hold into account that breakfast here is often not much more than some brioche bread with butter and a pastel de nata. Maybe some freshly squeezed orange juice before you swipe off the crumbs off of your shirt. None of that in Berlin. Nora and me have fond memories of eating a Turkish/Mediterranean breakfast some August noon, lashes of pasta with garlic yoghurt and spicy sauce, olives, cheese and sun-dried tomatoes and green salad somewhere near Platz der Luftbrücke in Berlin. I guess it’s gonna take a bit longer for that kind of seriously advanced food to make it to Lisbon, but in the meantime, there’s “Vélocité”, conveniently located near São Sebastião making a stroll through the Gulbenkian gardens and/or museum before or after the brunch an absolutely desirable and appealing way to wile away another Sunday of your life. The café itself (its name is a wordplay which you really need to learn basic French for in order to appreciate it, but it has to do with “bike”, “speed” and “city”, the rest is for you to google) is decorated like the bike shop that it is. There’s even a ramp with a fake bike path included which is mostly used by little children to run back and forth on. Saddles and other bicycle accompaniments, accessories and spare parts are hanging on the walls, all accompanied by a rather spicy price tag, spicy for Lisbon that is, but for those who are really into biking, it might warrant the cost. In the back, there are new bicycles for sale with prices so high to make an average Portuguese person’s eyeballs almost fall out of their sockets. Sure, there’s a cheap bike rental at your disposal and you get a 10% discount on your meal (not including alcoholic drinks) if you manage to bike your way to the café but “Vélocité” really is more of a bike shop for (probably foreign) enthousiasts rather than for beginners. Thankfully, the brunch won’t cost you your firstborn. For 12 of Europe’s finest 1 euro coins you get all of the usual suspects, such as golden creamy scrambled eggs, yoghurt, a freshly squeezed fruit juice, some high quality tea (they have some very special varieties of black tea which you wouldn’t easily find anywhere else in Lisbon), etc. It was however the not so obvious suspects that we really liked, such as the super yummy fresh tasting guacamole, the gooey quesadillas and a homemade banana bread which Nora was particularly fond of but that was a bit too sweet for me. It’s such a shame then that what they knock out of the ballpark for brunch, couldn’t be maintained when it comes to lunch. We came back another time (we are not that gluttonous) and I had the hamburger with Queijo de São Jorge and Nora had the filled mushrooms. The service was just as friendly and personal as the first time, but the dishes were neither particularly good or bad: the quality of the meat of the hamburger (really the star of the party) left much to be desired (more on the edge of processed rather than proper ground beef) and it came accompanied with some olive oil fried potato crisps, presumably out of a bag. Compliments to the chef however for the delicious, homemade tartar sauce but for 7 euros, I had expected a little bit more than that. Nora’s dish was also not particularly exciting and seemed to have been straight from the time when “Thriller” was still skyrocketing up the charts. It was not bad, but a creamy filling in combination with some dehydrated mushrooms, a plain Jane salad, pesto rice and a sauce with a faint taste of capers is really nothing to be excited about anno 2015. So yes, what sets “Vélocité” really apart from the other cafés or restaurants is its relatively cheap, high quality, original brunch and its original, yet cosy setting. Even though the rest of the food (which we have only tried two other dishes of, so maybe there are still some hidden gems there) is not as good, it’s a really nice place to work, read, sit, think, contemplate your life and wonder whether you really need whatever shiny new electronics you’re thinking of getting yourself for Christmas in El Corte Inglês later. With a bit of classy jazz and blues music playing in the background, it’s an extremely recommended place to get over your Sunday blues / Saturday night hangover. ← ZAAFRAN: A good curry cannot be hurried!